When it comes to cheese, Italy has perfected the art of making hundreds of different varieties of formaggio. With such a varied landscape, it is no surprise to find wonderfully different cheeses produced in the hills of Tuscany from that made in the fertile Po Valley or the mountains along the Sorrento Peninsula. Each region of Italy specializes in different varieties of cheese made with cow, sheep and even water buffalo milk. We’ve handpicked 5 of our favorites to highlight the areas where our Italy vacation rentals are located, including fvorites you might not have heard of and that you will love. 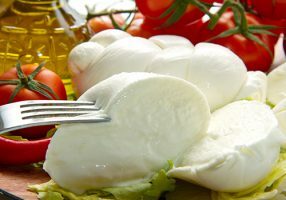 While mozzarella is a well-known cheese, the regions of Lazio, where Rome is located, and its southern neighbor Campania are famous for a particular type of mozzarella made with water buffalo milk. This fresh cheese is milky and has a delicate flavor. It is perfect on its own drizzled with a little olive oil perhaps or served with tomatoes and basil. Also a popular topping on pizza, it melts beautifully. Many associate this cheese only with the Campania region, but there are producers in southern Lazio just south of Rome, which means you can also enjoy excellent Mozzarella di Bufala Campana while visiting the Eternal City. If you like parmigiano, then you must try another of Italy’s most popular cheeses – Grana Padano. This hard cheese is called “grana” because of its slightly grainy texture as it ages. It’s a very old variety of cheese that was created about 900 years ago by monks at the Chiaravalle Abbey near Milan. Excellent on its own or grated over pasta, it’s produced in the Po Valley area, which includes the Veneto region south of Venice. A variety of cheeses made with sheep’s milk have been produced in the Tuscany region since ancient times. The Roman author Pliny the Elder wrote about the production of this cheese in his book Naturalis Historia that he began in 77 AD. While Pecorino Toscano can be eaten after about 20 days, it’s generally seasoned for about four months until it becomes a hard cheese. 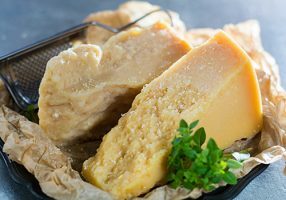 This is the cheese to try while visiting Florence, where you can eat it grated over pasta or soup dishes or enjoyed with fresh fava beans in the spring. Once you try Pecorino Toscano, there’s a world of different types of pecorino, or sheep’s milk, cheese produced throughout Tuscany to sample since each area of the region produces cheese that is distinctly different. In the rolling hills between Montalcino and Montepulciano lies the tiny village of Pienza, which is noted for Pecorino di Pienza. One of the most celebrated pecorino cheeses, the distinctive flavors come from the local vegetation the sheep graze on in the area around Pienza. How can you resist trying a cheese that was supposedly a favorite of Lorenzo de’ Medici? 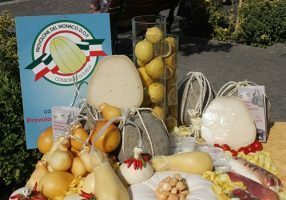 In the mountains of Sorrento, farmers have been producing the Provolone del Monaco cheese since the 1700s. This unique variety is made with milk from cows in the mountaintop town of Agerola on the Sorrento Peninsula and has a sharp and rich flavor. Its name comes from the heavy cloaks that the shepherds wore to keep warm in the winter cold which resembled monk’s robes, monk is “monaco” in Italian. While visiting the Amalfi Coast, Sorrento and Capri area, be sure to try this unique cheese because it’s hard to find outside of the Sorrento Peninsula.